Very light and airy, this room evokes a vibrant French country feel, decorated in tones of oyster blue and windham cream. This air-conditioned room provides a double and single bed with renovated private ensuite 3 piece bath, and is situated on the 2nd floor at the front of the house. This beautifully appointed Nautically inspired room decorated in rich tan and cranberry linen creates a warm and peaceful atmosphere. 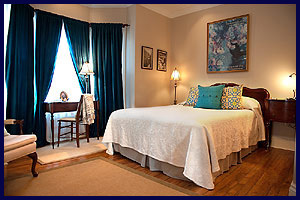 Located on the 2nd floor this air-conditioned room features a queen size bed and has a separate private, newly renovated 4 piece bath off the hallway. Decorated in an English Country style, in tones of delft blue and fern green, the room envelops you in its warm and calming atmosphere. 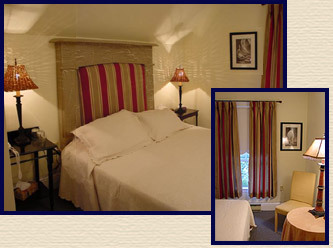 This air-conditioned room has a queen size bed and a private ensuite 3 piece bath. Located on the second floor overlooking the garden, this room enjoys the afternoon sun with refreshing cross breezes. Named for Mabel Bell, entrepreneur and wife of Alexander Graham Bell this room is located on the 1st floor at the front of the house overlooking the garden. 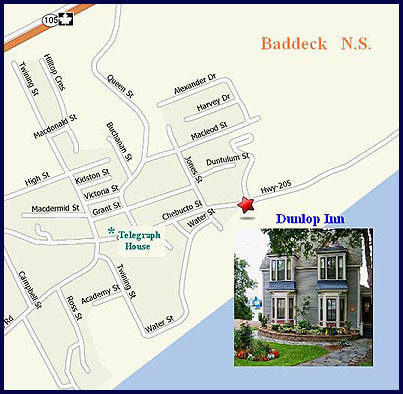 This elegant air-conditioned room has a queen bed and a renovated private ensuite 3 piece bath. Decorated in a Victorian style the room has a writing desk, a perfect setting for writing postcards and relaxing with a good book or enjoying an evening cocktail. 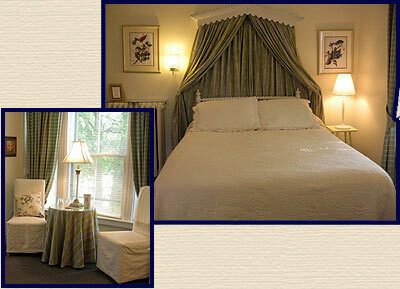 The Mabel Bell room continues to be one of our most popular rooms. This spacious sitting room is a wonderful area to sit and relax with a good book or evening cocktail. A CD player is available to enjoy relaxing music. 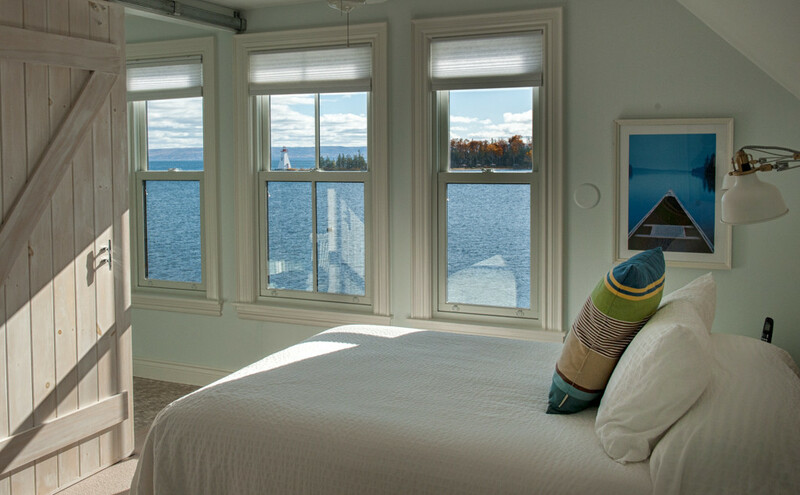 This sunny room with French doors leading to the upper waterside deck provides a wonderful panoramic view of the harbour and is a favourite spot to gather for a morning coffee or afternoon cocktail. The sea side inspired décor provides a casual and calming place to relax regardless of the weather. 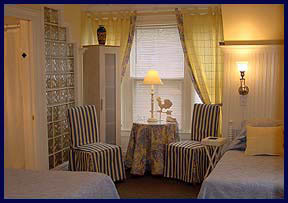 This popular sitting area offers videos, cable TV, board-games and magazines for your enjoyment. We are pleased to provide WIRELESS INTERNET on the premises.
" Grace, elegance & serenity live here - A wonderful haven on a stormy day. To watch the rain fall on the lake in the cozy sunroom was balm to the soul. A wonderful place to stop travelling & remain still. Much gratitude!" We offer a self serve breakfast (yogurt, fruit, cereal, eggs etc.) from 8-10am in our newly enlarged kitchen with French doors overlooking the harbour. Sit at the island enjoying your Nespresso coffee while taking in the view. 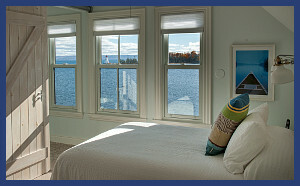 On warm days we are sure you will want to sit out doors on the upper or lower waterside deck. 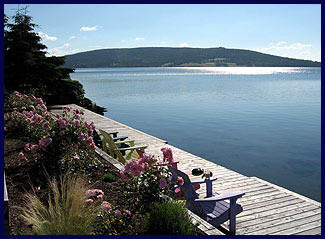 The Inn is the only accommodation in the Village to provide a private deck and beach for guest use. 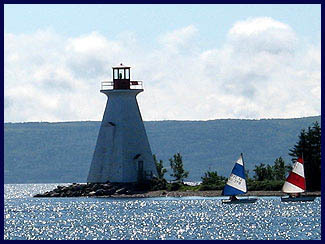 The view is spectacular and provides changing vignettes of sailing and marine life. Retire to the deck chairs and watch carefully to see the Loons in the early morning. Feel free to bring your kayak should you wish. There are also watercraft for rent in the area.
" I wish I could pack the view in my suitcase and bring it back to Chicago. " While at the Telegraph House please be sure to ask about Chef George's menu at the Cable Dining Room. We regret that we cannot accommodate pets of any kind. Check-in is between 2pm and 9pm. If you are arriving after 6pm, please call to advise us of your arrival time. Check out time for guests and their cars is 11:00 am. These times may be changed by prior arrangement. Deposits are refundable 7 days prior to arrival date. *Please Note: Regatta is the first full week in August (Sunday - Sunday). There are many events for the public to enjoy at the adjacent Yacht Club, including local musicians for nightly entertainment.